UNITED STATES—His dog on a leash, Davy exits from the room, passing by the two other beds, one empty and the other occupied by a woman in catatonia. 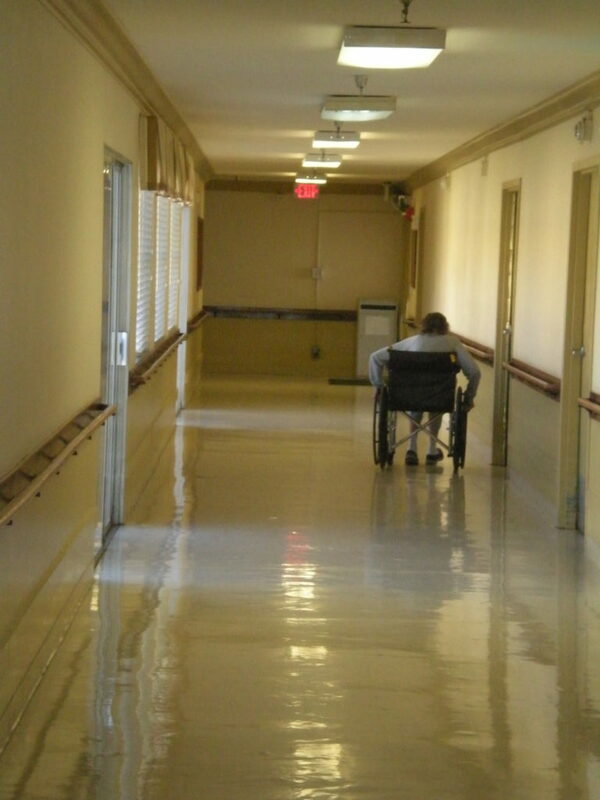 In the halls, there’s a man in a wheelchair pushing himself along with his legs. “I want to go back to my bed.” Mom shoots Davy a fierce look, raw and naked. Who knows what is going on in the skull, her hair now matted and combed like a man’s, since she came to this place. The second therapist straps a wide rainbow-colored cloth belt rather like a guitarrist’s shoulder strap, but it girdles the old woman’s distended belly. One, two, three: they hoist her to a horizontal bar, which she grips her finger-claws around with a pressure that could crush diamonds. “He wants to see you get well,” Willow says. Davy and the therapists chuckle. Davy and his mom are halfway through the lobby when they meet a visitor. It’s Tatiana, the hot caregiver. “You look adorable,” she says, with her eyes fixated on the elderly, suspicious woman. Tatiana bends down and fixates her green eyes on the mother’s wintry gaze and caresses her fine white hair. Tatiana’s boyfriend stares at the mother intensely. Davy isn’t even in the room, he’s a million miles away in Poughkeepsie. Together Oscar and Tatiana chant, “24/7… 24/7… 24/7.” Tatiana brings out the castanets, doing and interpretive dance number around the head of Mabel’s bed, accompanied by Oscar’s maracas. “People would pay a thousand dollars to have hair like yours. It’s truly platinum blonde,” says Tatiana. “I’m here,” says the mother, bed-bound in the nursing facility. “I’m the person who cares for you all the time and you don’t even remember my name,” Tatiana says coyly, as Oscar’s fingernails dig into the old woman’s flabby shoulder blade. Previous articleWas Super Bowl LIII The Worst Ever?